Summer is here, and with it comes plenty of light air days. Light air sailing may not be as physically demanding as sailing in big breeze, but it certainly has its own challenges. A friend once advised me that when it’s light, you should “think in slow motion,” meaning not to move around too much, overthink decisions, or get too stressed out. In light air, discipline, patience, and awareness can trump brute strength. 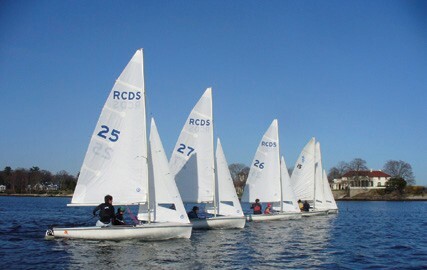 Sailing in any condition requires preparation, and light air sailing is no different. Light air days are often long days, and in order to maintain your focus and think clearly, you’ll need to keep yourself from letting the elements get the best of you. You may not need spray gear and layers, but you will still want to make sure that you have appropriate sun protection – hat, sunglasses, sunblock (reapplied throughout the day), and a long-sleeved rash guard or other cool yet protective layer. Polarized sunglasses will help you see the puffs on the water better. Also, stay hydrated! If you’re thirsty, it’s too late. You might find yourself in postponement, which can drive some sailors nuts. The best light air sailors have learned to be patient and relaxed, and thus are able to mentally shift gears back into race mode when the time comes. If it’s postponement on land, be sure that you take the time to double check everything on your boat so you can avoid breakdowns. Then find a way to relax and stay ready but not anxious (easier said than done!). Again, stay hydrated and out of the sun. When the race committee does decide on a harbor start, you will want to get on the water relatively quickly to warm up boathandling and to check out the conditions. You can bet that the race committee will be getting racing going as quickly as they can! On-the-water postponements can be tougher mentally and physically. If you can find shade on a coach boat, do so. Drink water and then drink some more water. At the very least do what you can to feel comfortable and relaxed, but keep an eye on how the weather conditions are changing around you. If the race committee sends a markboat to check out a breeze line or starts to set marks, you can bet that they’re about to drop the AP – time to start doing some roll tacks and getting ready to win! As you move around the boat on a light air day, you will want to move slowly, gently, and deliberately. Usually, movement should be like a cat – careful and silent. Exceptions are roll tacks, roll gybes, and unwinging the jib, when a sharp rock is both legal and necessary. As you head up and bear off, use your weight and sails to steer – rudder movement is slow! Upwind, err on the side of slight leeward heel – even the slightest windward heel can slow you considerably. When tacking, come out of the tack a few degrees lower than you think in order to gain speed before heading up again, and anytime you feel slow, don’t be afraid to foot a bit and ease your sails to get going. Pinching and/or overtrimming can be deadly in light wind. Downwind, telltales on your shrouds and/or spinnaker pole can help get the angle of your sails right. In light air, it is particularly important to get your head out of the boat and be aware of what’s going on around the racecourse. Finding a little bit more pressure will yield tremendous dividends, so look for the puff and find your way there. Avoid large clumps of boats when windshadows will be painful and work your way to clear air. Don’t forget the current! Its effects on your boat (including apparent wind, as anchored race committees sometimes forget) will be magnified in lighter breeze. Keep an eye on what other boats are doing; if someone else is going faster, emulate them, though don’t lose your cool if it’s something beyond your control such as getting to a puff that you simply can’t chase. Looking beyond the racecourse can also be helpful on a light day. Is there a breeze line filling in from somewhere else on the course? Can you see boats, flagpoles, or smokestacks that indicate a new breeze filling in from somewhere else? Are there “popcorn clouds” building over a landmass that might draw a seabreeze in later in the day? Or, are clouds building over a landmass like Long Island that might block a seabreeze? We’re all hoping for great breeze this summer, but on those light wind days, get excited to be the master of light air! Be prepared and get yourself on the water to find the breeze and go for it! Clemmie Everett is the Assistant Sailing Coach at Rye Country Day School in Rye, NY.